Quinton “Rampage” Jackson (Pictured) has revealed his doctor prescribed him Testosterone Replacement Therapy to help heal the knee he injured prior to last weekend’s loss to Ryan Bader. The former UFC light heavyweight champ claims it was his first time dabbling in the highly controversial treatment, but now that he has experienced its magnificence, he’s never planning to go without it. “I almost pulled out [of UFC 144], but then I went to see the doctor and he told me to talk to an age-management doctor,” Rampage told FightersOnly. “So I went and talked to them and they tested me and said my testosterone was low. They prescribed me testosterone, to bring my testosterone levels back up to levels where … I am the same as young people, like when I was 25, and it would help build my knee up. “I took what the doctor prescribed to me and I went to the pharmacy … I gave myself small doses and that [expletive] immediately changed me, that’s why I am saying now I am not going to retire. The 33-year-old blames the weight he gained while on TRT that caused him to tip the scales a whopping five pounds over the limit for a non-title light heavyweight affair. UFC president Dana White hasn’t been shy about expressing his disdain for TRT (Please see: Nate Marquardt). White, along with many others, believes the treatment provides a loophole which allows athletes to use TRT as a performance-enhancing drug. 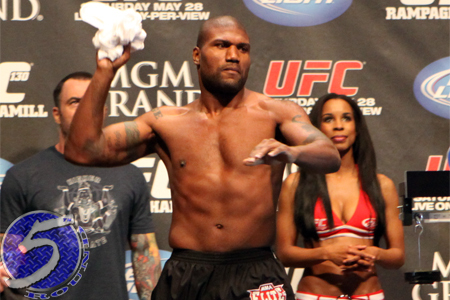 Rampage was initially hesitant over participating in the regimen, though quickly decided it was the best route to ensure he kept his appointment with Bader. “So I spoke to the UFC and they were like, ‘Yeah, a lot of fighters are probably doing it but not telling anyone.’ Me, I keep it real, I am not doing anything wrong. It’s legal and I am not abusing it and I am not going over certain levels. From what I learned about it, when I got tested my levels, my levels were really low and the doctor was telling me that athletes can burn testosterone. The cheater’s handbook for TRT suggests athletes are manipulating the regimen while preparing for a fight. They will jack up their testosterone levels beyond normal ranges in order to push their bodies to its outermost limits. As showtime steadily approaches, they will then taper off the treatment to get their testosterone back to a natural level – therefore, no flunked drug tests.